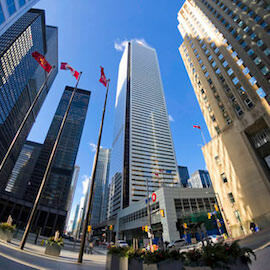 On the 58th floor of Canada’s tallest office tower at the corner of King and Bay in downtown Toronto, 15 Lazaridis MFin students got the opportunity to put their skills to the test and make stock pitches to Rob Lauzon, Lazaridis BBA ’97 and Managing Director of Middlefield Capital Corporation. Middlefield has been operating since 1979, first as a real estate developer then as an investor in oil and gas. Today, Middlefield has approximately $4 billion under management and deals in a wide array of financial products, including: ETFs, mutual funds, closed-end funds, private and public resource funds, hedge funds, real estate funds and a venture capital fund. The students had the opportunity to be invited to the Middlefield office thanks to Lazaridis MFin alumnus, Shane Obata, MFin ’17 who is Middlefield’s Director of Investments. After introductions were made, the MFin candidates went to work trying to convince the Middlefield team that the stocks they picked were good investments. The companies they pitched ranged from across many industries, including energy, mining, financial services and apparel. The Middlefield team provided real-time feedback to each presentation, offering notes on their analysis techniques, writing style, presentation skills and overall quality of the pitch. Many of the students who participated in the stock pitch session are also members of the Laurier Graduate Student Investment Fund, a daily working fund governed by MFin alumni and professors and managed by current students. By the end of the pitch session, the students had gained valuable insight into what the real world of financial investments requires of its buy-side analysts and how to deliver an effective pitch. The Lazaridis MFin part-time Toronto program is still accepting applications. If you see yourself joining Toronto’s growing finance industry, book a one-on-one meeting with one of our admissions advisors to discuss your future.